Prima Marketing Finnabair products for Mixed Media FUN! Mixed Media is all about trusting the process. It’s always messy in the middle and we have to let the creativity take over. Nicole here and I am sooooo excited to play with Prima. For this tutorial, I am using Finnabair. This is my first time exploring the textures, shimmer, and detail of these fabulous mediums and paints. I started by applying some torn book pages with 3D Gloss Gel Transparent making sure to apply an even coat over the paper. Add a layer with the Offset Dots Clear Stamp using permanent ink, Ranger ink Archival Jet Black. Add a layer of texture with Plaster Paste and mix in a little mint- green Patina Effect Paste to tint your Plaster Paste. Layer the 6×9 Passiflora Stencil and apply the Plaster Paste in an even layer. While the Plaster Paste was drying I cut “trust” with Sizzix XL Typo Lower die. Adhere the letters with Scrapbook Adhesives by 3L Dual-Tip Pen. Here is the perfect time to add more texture with the Stone Effect Paste, Limestone. This is where we really start having fun. Start blending the Patina Effect Paste mint-green, blue and brass on the letters, plaster paste stencil and edges. Finish off with a little shimmer using Icing Paste- Old Silver. 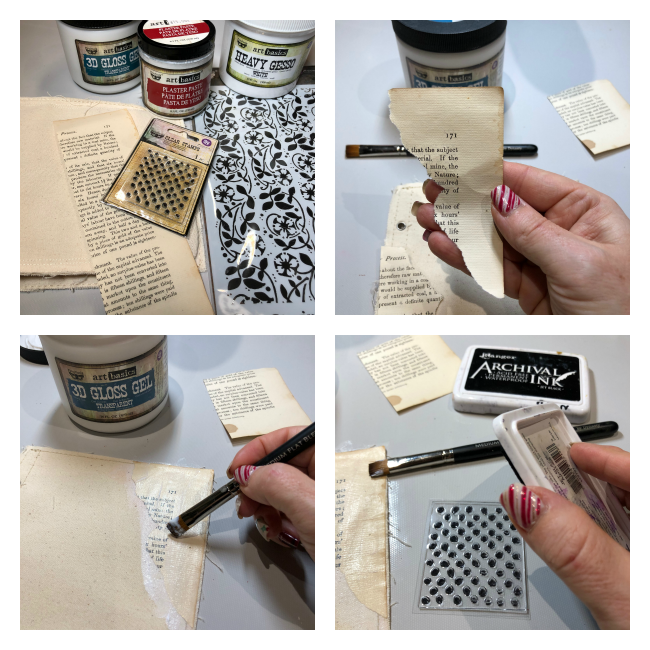 A great way to get your feet wet with mixed media or a new to you mixed media line is to start with a few paints, mediums, stamps and stencils. Mixed Media is an endless journey in creativity where the rules do not apply. Creating depth, vintage, and grunge with your next background, layout, home décor project or art journal. Keep watching my posts here and on my blog as I explore all the different product Prima has to offer. Scrapbook Adhesives by 3L Dual-Tip Pen. Keep watching my posts here and on my blog as I explore all the different products Prima Marketing has to offer. It’s very beautiful.. Love all the textures.